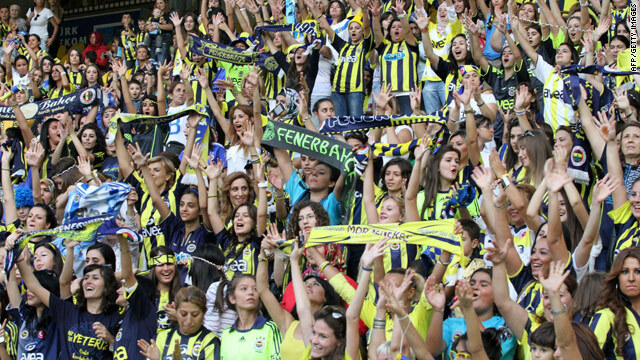 Women and children fill the stands in Istanbul's Sükrü Saracoglu stadium on Tuesday night. Soccer authorities in Turkey may have hit on the perfect solution for unruly fans: Ladies Night! The Turkish Football Federation had planned to make Istanbul favorite Fenerbahce play two games in an empty stadium after fans invaded the pitch after a friendly against Ukraine's Shakhtar Donetsk during the summer, according to a Turkish Weekly report. But new rules say those games will be open only to women and children under age 12, National Turk reports. Admission is free. The policy got its first test Tuesday night in Istanbul, as 45,000 women and children turned out to watch Fenerbahce and Manisaspor face off in the Turkish Super League. “It was such a fun and pleasant atmosphere. At first, we Manisaspor players couldn’t believe in what we were seeing and hearing,” Manisaspor midfielder Ömer Aysan is quoted as saying by National Turk. What they were hearing was something unexpected in the usual partisan atmosphere of Fenerbahce Istanbul’s Sükrü Saracoglu stadium: cheers for the visiting team. Players from both teams greeted their female fans before kickoff, tossing flowers into the stands, Turkish Weekly reported. Security was tight, according to Turkish Weekly, with a female-only guard force outside checking to see that no men entered the stadium. The game ended in a 1-1 draw, but that didn't dampen enthusiasm for the idea. “This memory will stay with me forever. It’s not always that you see so many women and children in one game,” Fenerbahce captain Alex de Sousa said at a post-game news conference, National Turk reported. If you come to Istanbul you should really cuise on the Bosphorus. Thank you a lot to Bosphorus Cruise , which was recommended by my friend, booking on internet. I went to a full day tour Bosphorus and Dolmabahce Palace. At the both sides of Bosphorus there are many historical places and incredibly beautiful scenary. My advise is to look at the side about which your guide is giving information because the facts given by the guide were short and fulfilling http://www.privatetoursinistanbul.com our tour started without delay and we visited different places. Especially Dolmabahce Palace was perfect with its architectural features .My other favorite place was Camlica Hill where you can take a look at the Bosphorus and other side (Europian one) and take a deep breath and relax. The scenary was wonderfull. We returned at our hotel on time and this is important for me, we did not have any delay. You may think that when you return to the hotel you will feel tired. Well I am not sure about that because the Bosphoruse Tour is really relaxing. I almost forgat J the lunch was a squere meal with so many variations of Turkish food. It was delicious. It was an unforgetable day. I'm extremely fair and have difuicflty finding foundations pale enough for me Dan Read's foundation in Fairest seems perfect! I've been exploring for a bit for any high quality articles or weblog posts in this kind of space . Exploring in Yahoo I finally stumbled upon this web site. Studying this information So i am happy to convey that I have an incredibly just right uncanny feeling I came upon just what I needed. I most indisputably will make sure to don?t fail to remember this site and provides it a look on a continuing basis.